DavidGX's House of Smaller Houses: Who inspired this rule? Sometime ago, after getting a job at Lowes I was sitting in a back room listening to the human resources guy talk a bit. The rules, the company ideals, such and such. One of the things he mentioned, straight from the documentation we had, was that Clogs aren't allowed to be worn by employees. THOSE kind of clogs? I just started laughing as the image of an employee coming into work in his wooden shoes, ready for the day ahead entered my mind. "What? 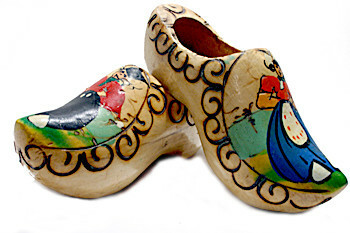 You can't wear those wooden shoes to work." The manager then thought "damn, gotta put that one in the rules". I'm not sure if that's how it happened, but that's how I imagine it. Because I'm weird like that.